Help! Ants Have Infested My Home! Home » Help! Ants Have Infested My Home! If you have ants around windows, doors, or other entry spots, spread peppermint essential oil around those areas. This will keep ants away and keep your house smelling fresh. In addition, you can try mixing a 1-to-1 solution of water and Dr. Bronner’s Peppermint liquid soap in a spray bottle. Spray directly on the ant colony for best results. This is about as easy as it gets. Boil a pot of water and pour it directly on the ant colony or on any weeds that have popped up between sidewalk cracks or in mulch areas in your yard. Weeds are a breeding ground for ant colonies, so adding hot water here can be very effective. Use a spray bottle filled with water and a squirt of dish soap and spray it on any ants you see. This method is safe to use inside your kitchen or cupboards if you observe the ants in there. If you spread cream of wheat around entry points, the ants will eat it. Because Cream of Wheat swells in their stomachs, this will be their last meal. If you have an ant problem in the garden, feel free to try this technique there as well. Using a vinegar/water solution on your countertops, mixed with peppermint for additional potency, can help treat your ant problem quickly. A mixture of Equal packets and apple juice can serve as a neurotoxin to the ants and kill them. 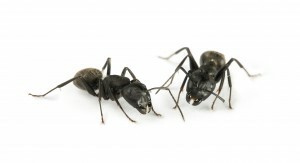 Spray liberally anywhere you see ants or suspect the presence of an ant colony. Once the ants are gone and you want to deter them from coming back, there are some natural ways to steer them in other directions. For example, ants will not cross a line drawn in chalk. You can buy chalk powder at home improvement stores and squeeze it into a bottle and draw it around your windows or door frames. In addition, using ground cinnamon or cinnamon essential oil will also keep the ants from coming in. Simply dip a Q-Tip in the mixture and line your windows and doors with it. If you have a problem bigger than you can handle, call The Bug Man for reliable pest control services that will eliminate the infestation quickly and efficiently!